Well, life has taken an interesting turn since I passed my PPL test last month. Specifically, I have taken a redundancy package from Suncorp after 5 years service there, and as of last Friday I am officially unemployed! A strange feeling. I’ve never been out of work since leaving university. In actual fact, I’m straight back on to the job market and have reasonable expectations of picking something up in the next few months. But, one of the side benefits of a little time off – within prudent budgetary limits, of course – is I might get a little more flying in! So I kicked off my sabbatical proper with an hour in the Bankstown circuit today in one of my old warhorse favourite aircraft, UFY. Today’s objective was simple. It’s been a little over a month since I last flew an aircraft, and I have plans to take a friend up in a couple of weeks time, armed (hopefully) with my new PPL. So I felt in need of a little brushing up on basic technique, and of course now being a PPL, I need to maintain my currency for passenger flying by making a minimum of 3 takeoffs and 3 landings in the 90 days immediately before taking anyone with me. My erstwhile Grade 1 check ride instructor, Ashley, was kind enough to sign me out, and also reckoned I was good to sign off the DI (Daily Inspection) on the aircraft by myself – a privilege enjoyed at the PPL level. That’s one less minor hassle I now have to deal with: I’m empowered to sign off the aircraft by myself. Takeoffs were to the east this morning on runway 11R, with information Golf and a light variable breeze. Despite 4 weeks out and a rather turbulent frame of mind due to my job situation, I went through the routine and mantra of my pre-fligh, taxying, run-up and pre-takeoff checks, and soon found myself at holding point Y2 for 11 right. Clearance duly received, I opened the throttle and was away. I am getting better – slowly, incrementally better! How do I know this? Because today I remembered to use a bit of right rudder pedal pressure from the very first takeoff, thus avoiding the fearsome drift to the left I experienced on my last circuits outing. Runway alignment today was maintained consistently, thank goodness. What was not pleasing – but perhaps not surprising – were my initial landings. The first four were – well – dodgy. Not unsafe dodgy, but poor technique dodgy. It took me until the 5th of my 7 circuits to execute a decent landing. 6 and 7 were also OK, once I hit my stride. (This was interspersed with a go-around on my 4th approach for landing, the tower having neglected to give me landing clearance by the time I was on very late final). I think I learned something though. My landings improved when I really narrowed my focus on the runway threshold and the piano keys ahead of me, and really concentrated on nailing my approach speed, using my feet actively to maintain runway alignment, and lifting my eyes to the far end of the runway after I was over the threshold. For some reason, holding off in the landing flare was a bit of a challenge for me today and it took me several goes to really get it right. Ah well, all good. As I’ve noted many times – any any good experienced flyer will also tell you – having a new PPL is basically having a license to learn. I’m under no illusions as to my ability and skills. Yes, I can fly a light aircraft competently and safely, but if there’s 100 steps between being a novice and a master, I reckon I’m on about step 5. On the 7th circuit, having achieved 2 decent landings, I decided to call it a day and requested a landing on the north side of the airport – if possible – to minimise taxying time. Tower cleared me to land on the big runway (runway 11C, or one one centre) and I made my 3rd decent landing of the day. Taxying back and shutting down, I was well pleased with the session and very, very happy to be back to doing what I love. Truly, any more than a month without flying and I get jumpy. 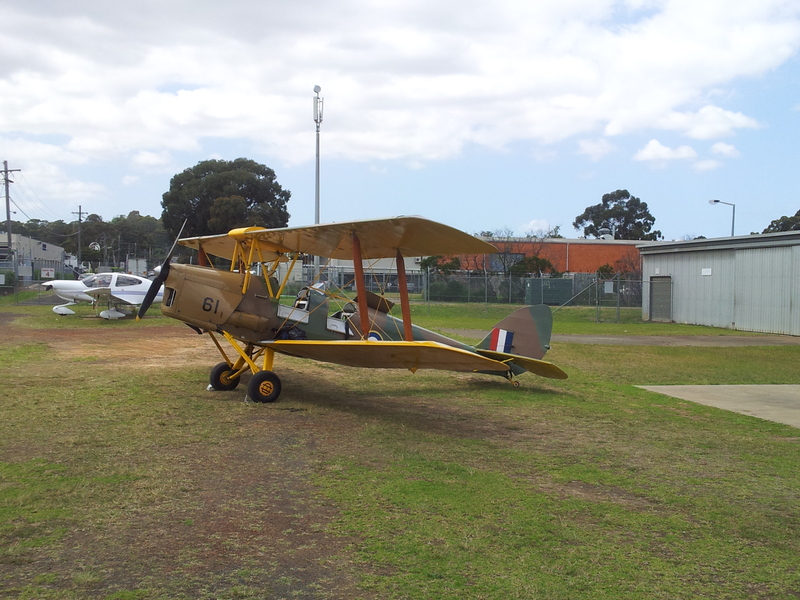 Having parked UFY on the flight line, I walked back to the club and was pleased to see this rather lovely Tiger Moth parked out the front of the Schofields clubhouse. They sure don’t make ’em like they used to. Before writing this blog post, I called CASA to check on the progress of my license. I’m told my application is on the top of the pile, and if (as is highly likely) they get to it tomorrow, they should be posting my license before the end of the week. I’m as nervous as a cat on a hot tin roof – I can’t wait to get the piece of paper in my hand! Mission accomplished: I am now a licensed Private Pilot! Well, it’s official. I flew my PPL test yesterday and passed with (dare I say it) “flying colours”! Well, not quite … in fact there were plenty of mistakes, on which I will reflect in this blog post. However, evidently none of them were deal-breakers. I can’t quite express how happy and satisfied I am at having reached this landmark goal that I’ve held for so long. In fact I think despite 8 months of regular flying I still can’t quite believe I’ve actually done it. For so long, for so many years, being able to fly seemed like an impossible dream. Then opportunity knocked in the form of a TV game show, and all of a sudden it was within reach. Now it’s done. Perhaps the best way to express my frame of mind today, the morning after, is “quiet but intense satisfaction”. Now, my customary “long blog post” warning should probably apply from here on in. I don’t know how long this will take, but I’ve got so much to download, this could be fairly lengthy. Totes props to any of you readers who make it to the other end. I got to the club at 0730 sharp. And I’m very glad I did. Given the packed morning I had (as I’ll relate) before finally getting away at 1245, getting there early and getting the aircraft squared away definitely paid dividends. I bumped into my instructor, John, who wished me well. The weather looked pretty good – CAVOK conditions – and he asked me where I was going. I told him I didn’t know, and would ask my test officer (our CFI, Bill) when he came in. John opined that I should have called Bill previously to sort this out. Well, I hadn’t (I’ve had a pretty distracting week at work), so I was a little apprehensive at that remark, but not overly so. I had the skeletons of 9 different flight scenarios already pre-planned, at least for the outbound leg. And there are only so many places you can go ex-Bankstown for a 2-3 hour round trip flight. So I figured I was reasonably prepared for whichever way Bill wanted to go. I grabbed a cup of tea and walked out to the flight line. I was able to spend a relaxed ½ hour with the aircraft, NFR. I called up the fuel truck and while I was waiting, turned on the master switch and checked lights and stall warning indicator. The landing light was out (as had previously been noted on the Maintenance Release) but all good otherwise. Oil was just over the minimum 6 litres, brake fluid reservoir nearly full. All else was good. I then sat in the cockpit and spent 10 minutes re-familiarising myself with the NAV/COM systems so as not to repeat my radio error on my previous flight. With full fuel on both tanks (and good luck wishes from the fuel guy), I filled a bucket of water and swabbed down the front and side windows, closed the aircraft and headed back to the clubhouse. As luck would have it, Bill was in the clubhouse when I got back from the flight line. I greeted him and asked him where he’d like to head for the test. Eyeballing the weather, Bill said he’d like to head to Bathurst, then down to Crookwell for some air work and back home via Bindook. I pulled out my flight plan for Bathurst via Warragamba and Katoomba and asked him if that worked – he said yes. So I downloaded the relevant weather reports and spent the next hour developing the full flight plan. Once done, I checked in with Bill. We started on some of the preliminary paperwork, then I commented that there was still a SIGMET in place indicating possibility of severe turbulence below 6000 feet over and in the lee of the ranges. As it was, winds of up to 35 knots were forecast around the 5000 and 7000 foot levels. After reflecting on this, Bill decided (with my fervent agreement) that perhaps heading across the ranges in a Warrior was not perhaps the best idea for today’s test (downdrafts, anyone?) so we quickly decided on an alternative: Cessnock/Scone via Warnervale. While still windy and somewhat turbulent, the weather looked decidedly better if we stayed east of the Great Dividing Range. So off I went for another 45 minutes or so of furious flight planning. I was thanking my stars (or more correctly, my pre-test preparation) for the fact that I already had that flight planned out as far as Cessnock, so I wasn’t starting from scratch. I only had this thought this morning: thank goodness I chose to fly the Cessnock/Scone with diversion scenario as my last dual training flight before the PPL test. I didn’t have to do that last training flight: I could have gone straight to the PPL without it. But had I done so, I would have gone into yesterday’s PPL flight a bit “blind”. I wouldn’t have had the extra experience of flying through the Lane of Entry. I wouldn’t have had the familiarising experience of flying for the Singleton NDB (Non Directional Beacon) and navigating to stay clear of the restricted Dochra military area around Singleton. Nor would I have had the experience of having to divert to and locate the Warkworth aerodrome to the west – which is exactly what eventuated yesterday. So I consider the fees for that last dual cross-country flight as money incredibly well spent. The second flight plan finally done, I swallowed hard and approached Bill to say that I was ready. Well that’s melodramatic of course – nothing so evil, though it does portray my moderate level of apprehension at that point. We closed the door, sat down, and got into the ground quiz. What is it about this portion of the practical tests? As was the case with my GFPT ground quiz, I got through it OK, but on several questions I found myself stumbling and on a couple I flat out said, “I don’t know”. Bill worked his way through the “Knowledge Deficiency Report” that spat out from my PPL theory test and satisfied himself (more or less) that I had adequate knowledge in each of the areas. Refuelling precautions? Check – good answer there. License privileges? No problems – nailed that one. Take-off and landing distance calculations? I’d already had them done and reviewed them with Bill earlier in the morning. No further questions, y’r honour. Interpret ARFOR? Fortunately the ARFOR for area 21 was reasonably straightforward. Bill asked me about the validity of a TAF (Terminal Aerodrome Forecast) and I fluffed half of the answer through simple mathematical error but nailed the other half and quickly corrected my error. It was enough to convince Bill I knew was I was talking about. OK, move on, nothing to see here. Engine temperature control? Pretty good answer. Pass. Pitot static systems? No worries. Lift? Man. Try as I did, I just couldn’t seem to understand the gist of the question Bill lobbed at me here. Went around it for 5 minutes or more. Whether he moved on out of pity, or I actually gave him the answer he was seeking, I’m still not sure. Less said the better. Visual scanning? Correct technique described, all good. Threat & Error Management? Flubbed the actual answer, though I think again Bill was convinced I have a general understanding of the TEM model. Mercy was shown. A couple of other technical questions which evidently were satisfactorily addressed, and Bill declared stumps. Time to get into the sky. The ATIS was information Golf, with takeoffs on 29R to the west, with moderate and gusting variable headwinds with crosswind up to 10 knots. Nothing too arduous. As I walked out to NFR, having signed out and grabbed the flight bag, I thanked myself for having gotten in early and readied the aircraft. All I had to do at this point was the fuel checks (first flight of day and after the morning’s refuel) and another quick walk-around, untying and removing the pitot cover. I opened up the cabin, got my stuff organised and by the time Bill got to the aircraft I felt squared away. I asked Bill whether he wanted me to demonstrate the aircraft inspection or go through the standard pre-flight passenger brief. He indicated that we could take those as read, so it was straight into the aircraft and into the start-up procedures. I think Bill liked the look of the little custom-assembled Flight Procedures Manual I’ve put together. I have A5-sized copies of the Bankstown aerodrome map, our club PA28 Cherokee flight procedures, a list of essential radio and NDB frequencies (Bankstown, Camden) and my own custom-developed pre-flight procedures checklist all mounted on cards and filed in a book with plastic sleeved pages. As I pulled it out and ran through the pre-start and post-start checks, I heard a quiet grunt of approval and saw the pencil go to his checklist – so a solid start, I thought. Bill also had a squiz at my flight plan and liked what he saw, at least I didn’t get any challenges about that. Out onto taxiway Mike 2 and taxi clearance obtained from Ground, I gave Bill a verbal Departure Brief and then pulled into the run-up bay. Run-up and pre-flight checks completed and the Emergency Brief delivered, we taxied for the holding point for runway 29R and held for a couple of minutes for a preceding aircraft to take off. Clearance obtained from Tower, I lined up and we were away. At 500 feel AGL I turned on to 010M for Parramatta and immediately felt the influence of the moderately strong westerly wind that was to dog me for the entire day. Flying a more or less northerly track for Parramatta, I had to lay off about 20 degrees to the left just to avoid getting blown over into Class C airspace. OK, at least I knew what I was dealing with. Over the Prospect-Potts Hill pipeline and it was up to 1900 feet over Parramatta. Pretty soon I picked up the Pennant Hills strobe light and was able to track direct for that point. Transponder to 1200 (for class G airspace) and radio to Sydney Centre on 124.55, I commenced a brief climb to 2400 feet and reported just south of Pennant Hills to alert any traffic possibly heading west to the Lane of Entry via Hornsby from the coast. This was a trick I picked up from John in my last dual training flight, and I think Bill liked it. Conscious of the westerly all the while, I was mildly stressed about finding the right angle of drift to lay off, varying between about 10 and 20 degrees left. Fortunately the various northbound landmarks (M2 interchange, Pennant Hills CBD, the Sands hospital, Thornleigh covered reservoir, Hornsby rail sheds etc) all materialised into view and kept me honest. The only real area of uncertainty for me was north of Hornsby: there’s about a 5-minute period there where you’ve got no more immediate landmarks and you have to trust your flight plan to pop you out correctly over Patonga. As I approached the Hawkesbury River area I sighted Brooklyn Bridge a little too close on my left, indicating that I’d been laying off a little too much drift and was in danger of impinging on the southbound Lane of Entry. I corrected this and made for what I was reasonably sure was – and which turned out to be – Patonga. Phew. First leg done. My next leg was planned to overfly the Warnervale Aerodrome. Over Patonga, I did the standard Time-Twist (heading bug)-Turn procedure, turned for my planned heading for Warnervale and shortly afterwards commenced a climb from 2400 to 7500 feet. Bill questioned me about the height I was planned to fly to – did I really want to get to 7500? My following track to Cessnock was going to require descending to 6500 feet anyway, why go so high? This conflicted somewhat with the advice I’ve always received from my instructor John – to wit, “height is your friend”. I didn’t feel it was the right time to say, “the Grade 3 instructor who trained me would disagree with you, Bill” so I kind of played a straight bat and continued climbing. Having reached 7500 feet and flown for a few minutes, Bill was kind enough to observe that “at least it’s smoother flying up here” – which it was! Then came the first glitch of the day. 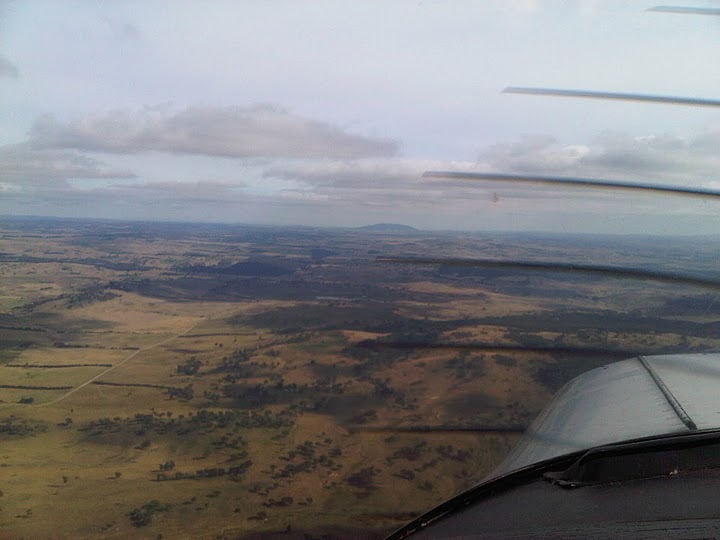 Searching for Warnervale Aerodrome, I started to form the view that I was too far north! And, I think in hindsight, I was also too high to accurately spot the aerodrome. Bill agreed, and opined that I’d already passed it. Clearly I was so focused on the climb to 7500 feet (during which, in the last 2000 feet or so, climb performance had been woeful due thinner air and my full fuel tanks) that I’d neglected to get my head outside the cockpit enough. A glance to the left and I saw the end of the mountainous area north of Sydney that borders the southern end of the Hunter Valley, confirming that I was already entering into the general vicinity of Cessnock Aerodrome, which was my next destination after Warnervale. So I decided to cut my losses and head straight for Cessnock. I relayed this decision to Bill, who agreed calmly enough. I changed course and descended to 6500 feet. Bill also commented that our groundspeed had been quite slow (he’d been monitoring the GPS in the cockpit, more on that later) and that as a consequence he’d like to do a few touch-and-goes at Cessnock, rather than overflying direct for Scone per the original plan. OK.
Over the ranges and into the Hunter Valley, I informed Bill that I would approach Cessnock Aerodrome on the dead side of the circuit and would descend to 1700 feet to overfly the aerodrome if needs be. Bill commented that while a lot of training material recommends overflying at 1500 feet AGL, this is in fact circuit height for heavy aircraft (jets, RPT etc) and the strictly recommended height is 2000 feet AGL. My question was, how can you see the windsock from that height? Good question, Bill replied! Basically it comes down to conditions and common sense, in Bill’s view – for example, there is no RPT operations around Cessnock that he is “aware of”, and 1500 feet was OK for today. Down to 1700 feet and approaching Cessnock from the west, I had tuned in to the Cessnock CTAF in an effort to identify which direction the traffic was using. I had intended to overfly the aerodrome and spot the windsock (mainly to show Bill that I was aware of proper procedure), however we heard a couple of transmissions and saw traffic confirming that circuit direction was on runway 35. So Bill recommended we descend to circuit height and get on with it, which I did quickly, dropping to 1200 feet and joining mid-crosswind. As I did so, I ran through the prelanding checks and saw another box get ticked off on Bill’s worksheet. First up was a standard landing with 2 stages of flap. Radio calls were fine and so was the approach, though the wind was pretty choppy down low and I was struggling a bit to fly proper square circuit legs. Final approach was fine, though – of course – I had to drop it down hard, having fallen prey to my old bugbear of flaring too early above the runway. Bugger. Oh well, anyway, down we were and then with flaps quickly retracted we were off again. Put it out of the mind and move on. Second circuit was much better. Managed to fly the legs reasonably square, and I remembered to fly an extended downwind leg as this was to be a flapless landing. In any case, traffic ahead of me was doing the same. On the way in, Bill advised that after this landing we would depart to the north and head for the Singleton NDB. And fortunately, this one was a greaser! I more or less intentionally managed to keep my speeds 5 or so knots above normal – is as the procedure for a flapless landing in Cherokees – touching down lightly at around 75 KIAS. Much better. Flaps in again, and off we went. Climbing to circuit height, I levelled out and continued on runway heading for 2 nautical miles, extending the upwind leg so as to depart the area safely. Once clear of the aerodrome, I made a departure radio call, then as per Bill’s instructions set course for the Singleton NDB and commenced a climb to 4500 feet. As we climbed, Bill took me to task for the way I was flying the aircraft in terms of controlling pitch. I was struggling to reach the Best Rate Of Climb airspeed of around 80 KIAS, and was probably falling into the trap – in my admittedly overanxious state – of chasing the VSI (Vertical Speed Indicator) as it dipped above and below the zero mark in the choppy air. The gist of what he was communicating to me was that I was failing to use my Attitude Indicator properly. He told me to choose the correct attitude for the climb – in this case about 5 degrees above the horizon I think – then trim it out and leave it alone. This frankly has not been a big part of my training to date. In the climb, the main instrument I’m used to using is the Airspeed Indicator – making sure I’m at the correct speed (usually around 80 knots BROC), not too fast and definitely not too low, risking a stall. The only time I’ve had to really pay much attention to the Attitude Indicator is during my mandatory 2 hours of instrument flying – under which circumstances the Attitude Indicator becomes all-important. Bill offered the view that many instructors tend not emphasise the importance of using the Attitude Indicator during PPL training, resulting in the need to breaking “bad habits” when pilots progress to higher levels of training and instrument flying. Anyway, he was at me about this all the way to the NDB and intermittently for the rest of the flight. I was of course unsure whether this meant black marks against me for not flying within altitude tolerances, or whether it was in a more general sense part of Bill’s approach, which is to instruct in ways that don’t influence the outcomes of the actual check ride. Also he may have been intentionally building up some pressure on me to see how I would perform under a bit of pressure. A few miles south of the NDB Bill informed me that once past the NDB he wanted me to do a 45-degree of bank steep turn to the left. Oh, great. Just the thing I’d been hoping to avoid having forgotten to practice this manoeuvre on my recent solo flight in the training area. Well, I’m not sure if it was the accumulated pressure and stress, but quite simply I ballsed up the first attempt. In a nutshell, I didn’t bank past 30 degrees but (as per steep turn procedure) I did open the throttle full wide and consequently found myself over-revving the engine and climbing well outside of desired tolerances for a steep turn. Bill was not overly pleased with this. Not sure if this was strictly allowed in terms of stepping outside his role, but Bill saw fit to demonstrate a short steep turn to me, driving home again the importance of using the Attitude Indicator to maintain desired pitch. I humbly (and quickly) asked for a second chance, to which Bill agreed, and this time – thank goodness – I managed a reasonable attempt. I find steep turns a bit of a challenge, and of course while I should really have been observing whether I was maintaining a constant attitude (relative to the real horizon or to the Attitude Indicator), what I was of course watching were my altimeter (to try to avoid climbing or descending too far during the turn) and my Directional Indicator (to try to ensure that I anticipated the roll-out to straight-and-level by 30 degrees or so). It was a bit up and down, but I pretty much nailed the roll-out on the desired heading and managed to bring it out flat on 4500 feet, from which I’d started the turn. Whether out of eventual satisfaction or despair I can’t be sure, Bill said that would do for now. And then – this was where I was so thankful for having done the previous cross-country flight up in the area – Bill said that instead of heading for Scone he would like me to divert to Warkworth. He offered to take the controls while I sorted out maps, headings and so forth. Fortunately, this took me all of 30 seconds or so. I pulled out my VNC (Visual Navigation Chart), and sketched a quick line from the Singleton NDB to Warkworth Aerodrome. Reading from this line a true heading of about 270 degrees, I subtracted local variance to arrive at an estimated required track of 258 degrees magnetic. And laying my notched pencil over the flight planned track, I quickly estimated about an 8-minute flight to Warkworth. Resuming the controls, I quickly radioed Brisbane Centre and made my request for a flight plan amendment. This exchange went perfectly, with Bill’s only comment being that I should also have identified myself as a VFR flight. So, we were off west to Warkworth flying at 4500 feet, with me anxiously searching for the airstrip. Fortunately, I arrived more or less directly overhead the airstrip and was able to identify it quite distinctly from 4500 feet altitude, a good 2000 feet lower than when I’d last been over the area. (Having located the aerodrome a few days previously on Google Maps didn’t hurt, either). I pointed out the aerodrome to Bill and indicated that I would overfly it before changing course southwards. Bill concurred, and then asked me to prepare a track southbound for the Mount McQuoid NDB. As it happened, I’d planned the flight assuming a southbound leg from Scone to Warkworth and thence to McQuoid and home, so I already had the required magnetic heading at hand. Therefore over Warkworth it was a simple matter to do Time-Twist-Turn and get sorted out for McQuoid. Once established on the southbound track for McQuoid, Bill asked me to hand over the controls and to put on the hood. I hadn’t expected this, but I’ve been quite comfortable with the hood work so far in my training and saw no reason to be scared of it this time around. Bill said that he wanted me to fly on instruments for a few minutes. 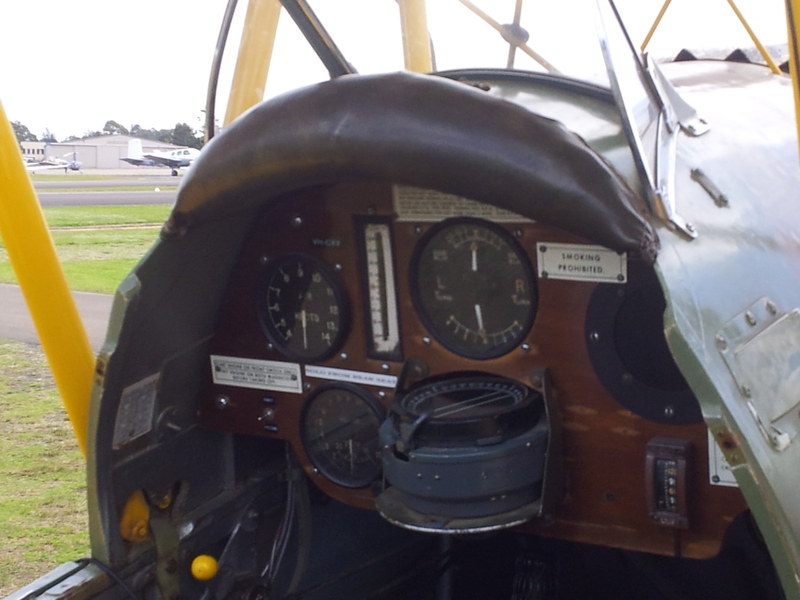 So with the hood on, I focused on my Attitude Indicator as the primary instrument, and my other instruments as secondary, and moved into the rather zen-like state (at least that’s the way it seems to me) of relying solely on your instruments. At the PPL level, I believe the goal is to stay within 5 to 10 degrees either side of your desired heading, and within plus or minus 100 feet of your required altitude, all the while of course maintaining a steady desired attitude for straight and level flight, turns, climb or descent as the case may be. Four or five minutes in, evidently this part of the flight was successful and I was allowed to remove the hood and resume visual navigation. With a good 20 nautical miles or so to go, Bill took the opportunity to quickly demonstrate some of the features of the (rather antiquated) GPS system installed in NFR’s NAV/COM stack. I’d already indicated in conversation earlier in the day that I was keen to get my head around GPS navigation, about which Bill was very supportive as he’s a keen advocate of “use every bit of equipment available to you in the cockpit”. Whereas I think my instructor John is more of the “navigate by dead reckoning” school of thought, at least so far as PPL training is concerned –hence my training has had no GPS content to it. Didn’t take Bill long to convince me that my next learning step is to get into GPS navigation (as a secondary means of navigation, of course, to back up the traditional methods I’ve learned). For a start, knowing just how far I had to go to reach the NDB was invaluable – no need to guess, you know at any point exactly how many nautical miles away the waypoint is. And further, knowing exactly what my current magnetic track across the ground was, versus the track required to get to McQuoid, took all the guesswork out of chasing the needle on my Automatic Direction Finder. And this was just an old GPS unit – lacking all the fancy features of more recent ones, with on-screen maps and what-have-you. Once at McQuoid, Bill took the controls while I practised entering our next waypoint – in this case, the NDB at Calga just north of Brooklyn Bridge – into the GPS unit. And bang, there it was. Too easy. Descending to altitude 3300 feet to be under the 3500 foot control step by the time I reached Calga, I was well set up for the Lane of Entry and well clear of Richmond airspace as well (which had nearly been my nemesis in my previous flight up that way). So note to self: when southbound for the Lane of Entry, use Calga NDB as final waypoint before Brooklyn Bridge! As we approached Calga, Bill also pointed out to me a region of some cleared spaces on low peaks off to our left, one of which is (apparently) an airstrip at Mangrove Mountain. Useful to know in the event of a forced landing or PS&L scenario, over an area otherwise consisting pretty much of hills and bush. Anticipating flying down the Lane of Entry and approaching Prospect and Bankstown, I already had my required radio frequencies dialled up and had a sneaky listen to the Bankstown ATIS to find out conditions there. Bankstown was on information Juliet, with landings on 29R to the west and with a crosswind alert. Great, good to know well in advance. Descending to 2400 feet to be under the control step, I flew over Brooklyn Bridge and made my southbound call to Lane of Entry traffic. Conscious of Richmond to the right, I scanned keenly for the Berowra strobe, which Bill informed me had been inoperative the previous night. (It’s out very frequently, apparently). I was all set to have to visually identify the Berowra township itself and the strobe area just to the southwest, when I saw the strobe and was therefore able to relax a bit and head straight for it. Once there, I set the required southbound track for the next waypoint – being the strobe on top of the Dural tanks – and started to scan for it. With the westerly wind very stiff now, I had to lay off drift to my right to avoid getting blown left into controlled airspace, and as a result allowed myself to stray a bit too close to Richmond airspace on the right for Bill’s liking. He alerted me to this but was kind enough to allow me to correct the situation – which in any case was not out of control as I’d correctly identified the electricity substation at Galston and was keeping it well clear to my right. What I hadn’t spotted – until Bill pointed it out to me – was the second strobe flashing quite prominently just out and off to my left. Additional note to self: actively scan when up and down the Lane of Entry. Use my head and neck, lean forwards, don’t allow the windscreen pillars to obscure my vision of important landmarks. Once the second strobe was reached, it was then a matter of heading south over Castle Hill and visually locating Prospect Reservoir, and descending to the required height of 1500 feet for the Prospect reporting point. I made another check of the ATIS – still on Juliet – and then dialled in the Tower frequency, to monitor local traffic and prepare for contact with the tower. And it was at this point – though I didn’t realise it until down and parked – that I made my last mistake of the day. And a blood annoying, niggling mistake it was too. I forgot to change my transponder back from 1200 to 3000 once I dialled up tower frequency and approached the Bankstown control zone. Simple mistake, but not a good one to make. Fortunately, this didn’t finish me off as I’d correctly set the transponder when exiting the Bankstown zone at the start of the flight. I reckon Bill put this down to stress of the flight, and let it slide. It pissed me off though: after all the flights on which I’d correctly executed this simple part of the procedure, I had to pick my PPL test flight as the first (and only!) time to forget it. Reaching the quarry east of Prospect which serves as the reporting point, I reported inbound and was cleared to join downwind for runway 29R and maintain 1500 feet. I turned left and headed for the airfield, searching as I did so for the Dunc Gray Velodrome which now serves as a landmark for GA VFR aircraft approaching runway 29R. I ran through the BUMFISH checks and, once more or less abeam of the velodrome, I reported downwind and was cleared for a visual approach to 29R, being number 1 for the runway. Happily, I made a pretty good job of the approach and landing. As I’ve blogged before, I’ve found the quick drop from 1500 feet to circuit height (1000 feet) and then getting set up for approach and landing to 29R a bit of a rushed challenge in the past. But thankfully yesterday it worked out well. I can’t quite recall my exact sequence of actions (throttle back and nose down, carby heat on, 2 stages of flap) to get down to 1000 feet on time to reach circuit height on late downwind, but the base turn was right on schedule, at the right height and airspeed, and after a bit of initial juggling to get aligned and on the right approach path, I nailed the final landing. Lovely to hear those tires go “chirp” for the CFI on the last lap of the day! Off the runway and with taxi call made to Ground, I taxyed for parking and ran through my CFROST checks. Bill was asking me why my switches weren’t off yet – not sure if I’d adequately demonstrated to him that I had the right post-landing procedure in hand – but I told him I was using CFROST and he seemed happy enough. I taxyed very carefully off onto the grass and into parking, ran through the shut-down procedures, and then took one deep, deep breath. I was mentally and physically exhausted! 2.7 hours on an often-choppy PPL check ride, with no break for a stretch, and my right leg had been a bit crampy on the way home. There’s no question but you do plenty of work on a PPL check ride. Bill started to debrief me on the flight and review the things we’d discussed and he recommended I focus on. Not wanting to interrupt him, I listened patiently for about 10 or 15 minutes, until I could stand it no longer. My gut said I’d probably passed – just – but I needed to hear it one way or the other. So I said, “So, how’d we do here, Bill?” And the bugger just offhandedly looked at me and said, “Oh, yeah, that was alright, you passed” and then grinned at me. He then offered me his hand and congratulated me, and I thanked him – genuinely – for being part of what was one of the proudest days of my life. To cap off the afternoon, some CASA paperwork to finalise outcomes of the test and apply for my PPL, and then the last thing that had to be done was an English language proficiency test. This consisted of Bill playing me a couple of audio tracks from his computer, put together apparently by people at CASA and consisting of imaginary “in flight” scenarios and conversations between pilot and air traffic controllers, speaking variously with very heavy, impenetrable “foreign” accents. The gist of the exercise was for me to listen to these scenarios and then describe to Bill exactly what was going on. Simple enough for me, as a proficient English speaker, though I can see that this would have been a stiff test for those with not proficient with English – which I suppose is the whole point. I had enough trouble listening carefully for 5 or 10 minutes as it was, after the often-arduous flight, but evidently Bill was satisfied. A final handshake and a promise to mail the papers to CASA immediately, and we were done. Missing Warnervale. I think 7500 feet or so AGL is just too damn high an altitude from which to visually locate a small aerodrome. I had the same challenge when I was trying to locate Warkworth Aerodrome from 6500 feet back in my last dual cross-country flight. Conversely, as I related earlier, I had no problems locating Warkworth yesterday from 4500 feet. (Though admittedly I’d been there before). So my tentative thinking here is: if I’m trying to locate an aerodrome I’ve not previously been to, 4500 feet or so AGL is about the limit from which I can hope to spot it. Overflying the aerodrome. Strictly speaking this should be at 2000 feet AGL to avoid circuit traffic at 1500 feet AGL (heavies, RPT etc). But it’s kind of a “common sense and circumstances thing”, according to our club CFI. Maintaining desired pitch attitude during flight. Whether you’re climbing or descending, or in straight and level flight, pay attention not just to your attitude as indicated by looking out the window, but also to your Attitude Indicator. If you use the AI to set and maintain the desired pitch attitude, and trim the aircraft properly, you won’t need to chase the needles and should be able to fly effectively “hands off”. Use GPS technology where available. Of course, only as a secondary means of navigation. But man oh man, it’s handy. Actively scan for the strobes and landmarks on the Lane of Entry. One might be hiding just behind the windscreen pillar and out of your sight if you’re not actively and fully scanning – left, right and forwards. Setting the transponder when exiting/entering Bankstown control zone. ALWAYS ALWAYS ALWAYS make the required change to transponder setting at the same time as I change radio frequency, both when exiting Bankstown control zone (radio to 124.55, transponder to 1200) and entering it (radio to 132.8, transponder to 3000). No exceptions. So here we are. 8 or so months after my first flight, and with many significant landmarks along the way. Lots of things stand out. 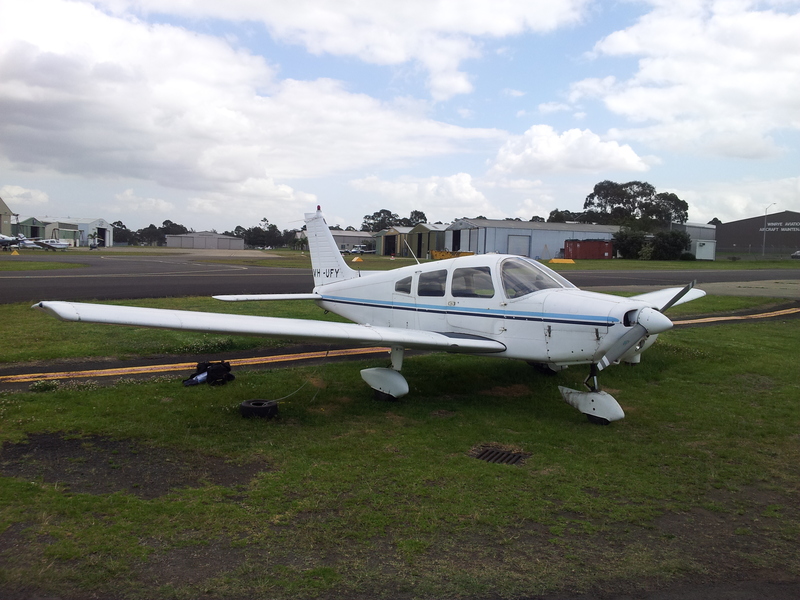 My first cross-country solo, including a close encounter with a Diamond aircraft in the Wollongong circuit. All in the space of 8 short months. And here I was – here I am – suddenly having reached the goal that so many have shared over the years since general aviation became accessible to members of the general public. Not to over-romanticise too much, but I do feel as though I’ve joined a very privileged and select group of people: those who are lucky enough to be able to step in an aircraft and “slip the surly bonds of earth”* for a few hours at a time. * With a nod to John Magee, an American pilot and poet killed in a flying accident while serving in the Battle of Britain. Magee wrote the famous and rather lovely poem High Flight. And, hiring John to show me the ropes of the Victor One/Harbour Scenic flights over Sydney. Plus I also want to get my head around using GPS as an additional navigation tool. And I wouldn’t mind getting a CSU/retractable endorsement in the near-ish future as well. Gettin’ ready for the big one: PPL test next week! Right, then. We’re getting down to the final 10 minutes of the game here. Specifically: if next Wednesday’s (14 September) weather holds up, I should know by about 3.00pm that day if I’ve finally got my coveted Private Pilots License. Having completed my final dual cross-country flight, I also flew a quick hour in the Bankstown training area back on 26 August. Practised my stalls (power-off and in landing configuration), forced landings and Precautionary Search & Landings. Much to my annoyance, I forgot to practise my steep turns, on which I may be tested and to be frank I haven’t really got them nailed yet. But, c’est la vie and all that – will just have to focus and nail them if asked to do it on the day. Stalls were fine. Forced Landings were OK – maybe a 6/10 – I only realised after I’d done them that I’d incorrectly put the aircraft into a glide at 80 knots, rather than the “Best Rate of Glide”speed of 75 knots. Won’t make that mistake in the PPL test! Precautionary Search & Landing again OK, though I made a bunch of passes over the landing area at 1000 feet above ground level and neglected to drop down to 500 feet above for final pass and to simulate actual landing approach. Again, won’t make that mistake in PPL. In any case I’ll be revising all these procedures in my Flying Training Manual over the next couple of days to make sure I don’t forget any detail. It’ll be OK. Most annoyingly, before taking off at Bankstown for that flight I made the very rookie error of believing that I was transmitting from my COM2 radio while the transmission switch was on COM1. Consequently, I made repeated calls to the Tower over the Ground frequency. Convinced I had radio problems, I requested permission to taxi back to parking and was given permission to taxi via the runway (having already approached the runway holding point). Once off the runway and halfway to parking, I spotted the error, turned around and headed back, with apologies to Ground (who were very nice about it I must say). One lovely thing about this flight: cloud was scattered puffs of fluffy white cumulus at about 2000 feet, so climbing up through and above them to 4000 feet to practise my stalls, I was treated to the lovely vista of white clouds immediately below me. There’s something new about every flight I do, and in this case, I do believe it was the first time I’ve flown solo in the training area with significant cloud below me. Made it a slight challenge to navigate visually so as to stay within the boundaries of the Bankstown training area – a new twist that I’d not had to manage before. It seems prudent to go over all the theory and all the practical stuff outlined in the Flying Training Manual as well. Here’s when I feel very blessed by my memory’s capacity for retaining heaps of stuff through short-term study. Have been through the BAK and PPL theory materials, just working my way through Air Law again and then I’ll hit the Flying Training Manual (boning up in particular on Forced Landings, Precautionary Search & Landings and Steep Turns). Then it will be my little “cheat booklet” on the Piper Warrior with all the operating speeds and performance matters specific to the aircraft. Then I think I’ll pull out ERSA and my maps and bone up on all of the aerodromes I’m likely to be possibly landing at or navigating to on the day (depending on where the weather dictates that we fly to on the day). Make sure I’m clued in to aerodrome specifics (for example, at Cessnock you have to call ahead to get permission to land, and on runway 35 up there they only do right hand circuits). Further, a survey of possible/likely diversion destinations would seem prudent. And finally, I think I’ll pull out my old flight plans and have them ready to choose/copy from when my flight route for the day is determined. The less flight planning I have to do from scratch on the day, the better. Gonna get me a good night’s sleep on the night prior – not too much study hopefully. Make a decent lunch and take a big bottle of water. Aircraft (my reliable old NFR, hopefully) is booked for 9.30am, but I’ll be there at 7.30. Will get it fuelled up and inspected early, and I wouldn’t mind 10 quiet minutes in the cockpit to completely refamiliarise myself with the radio and navigation systems. Make sure I have the radio buttons all sorted! And focus. (As I write I have the spectre of a job redundancy hanging over me, which is of course quite stressful – I’ve gotta put it out of my mind for Wednesday). And – as several have advised me – take it carefully, treat it as a passenger flight, and enjoy it! Last Monday, on probably the best day for flying I’ve enjoyed in my nearly 60 hours so far, I finally managed to get out for my final cross-country navigation exercise. It was a truly magnificent flight: I think I enjoyed it more than any other so far. However, like all flights, it was not without its challenges and hiccups, as I’ll relate. Fly again up and down the Sydney Lanes of Entry. (These routes have to be flown quite precisely and I’d only been through them once before, on my first navigation exercise. Club policy is to require students to have flown these routes twice dual before being allowed to go solo through them). Generally do a last “consolidation” cross-country flight before heading into my final PPL test. I’d booked one of the club’s Archers, SFA, for this flight. I’ve only flown it once before. It’s a slightly better touring aircraft than the Warrior as it has a bit more grunt up front (cruising at 110 KIAS vs 105) and is a better performer – in terms of range vs passenger load – than the Warrior. Unfortunately, SFA was due and into its 100-hour maintenance on Monday, so I missed out. Denied SFA, I quickly rebooked Warrior UFY (flown on my first cross-country solo flight) only to find out that my instructor had booked another Warrior, IJK, which I hadn’t yet flown. (IJK was undergoing a comprehensive engine replacement and external/internal refit in the earlier stages of my training, which is why it was new to me on Monday). I’m always up for flying a new aircraft, so I elected for IJK. Weather checked (CAVOK conditions) and flight plan done, I headed out to the flight line. For an aircraft just out of a comprehensive refit, IJK was mildly suss, I must say. Landing light was not working and the strobes on the wings were only functioning intermittently. However, given the weather conditions we decided these were not issues requiring a change of aircraft. Of ever so slightly more concern was what appeared to be a slightly stuck or damaged fuel drain below the right fuel tank. After fuelling, the standard test for fuel quality involves draining a sample of fuel, via the fuel drain valve, into a container to identify any water or impurities in the fuel. On doing this, the fuel drain developed quite a steady drip of fuel. On manually pulling the drain down, the drip stopped. Given that the fuel drip had ceased, we decided to fly to Cessnock on the right tank and (upon landing) check our fuel situation there. 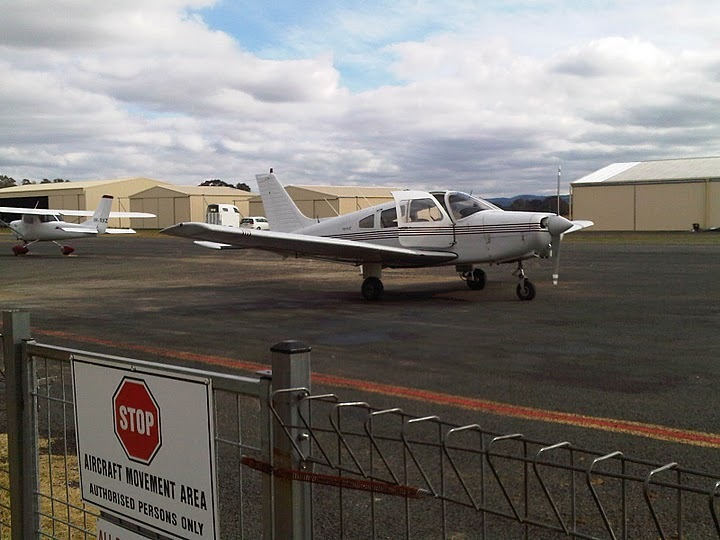 If the right fuel tank drain was leaking in any way and our fuel supply was diminished, we could refuel at Cessnock and in any case have more than enough fuel in our full left tank to make it back to Sydney comfortably. In the unlikely (in our judgement) event of running out of fuel in flight en route to Cessnock, we could always switch to the left tank. (In any event, as I’ll relate, we suffered no loss of fuel whatsoever). I started up, taxyed out to the run-up bay and ran through the pre-flight checks, deciding to do the pre-takeoff checks before engine run-up as engine temperature was not yet quite in the green. All done, we taxyed to the runway and took off to the west on Bankstown’s runway 29R (right), climbed to 500 feet and then made a right turn towards Parramatta on a magnetic heading of about 010 degrees. Reaching 1000 feet, I levelled out until over the pipeline that runs east from Prospect Reservoir to Potts Hill, then climbed to 1900 feet to clear Parramatta, changing to area frequency (124.55 mHz) and transponder code to 1200 as I did so. The Parramatta to Cessnock leg was essentially two stages. First, head north up the Lane of Entry from Parramatta to Patonga. Second, track direct from Patonga to Cessnock. The Parramatta-Patonga stage was the first time I’d navigated along the Lane of Entry without any assistance. It went well enough. AirServices Australia publishes a handly little spiral-bound guide for entering and exiting Bankstown Class D airspace, complete with landmarks and navigation references, magnetic track headings, radio frequencies and altitude limits, that made it (relatively) easy to map-crawl all the way to Patonga. Once over Parramatta I climbed to 2400 feet and changed to area frequency 125.8 just before overflying Pennant Hills. Then it was further northwards over Hornsby, and another 10 minutes or so before identifying the small Hawkesbury area communityof Patonga lying in a small sheltered beach north of Berowra. Along the way, John recommended making a radio call when northbound just before Pennant Hills, which is just south of Hornsby. Hornsby is the point at which northbound aircraft can turn right to track towards the coast for Longreef (usually aircraft planning to do Harbour Scenic and/or Victor One flights down the coast). They also track back from Longreef to Hornsby to rejoin the Lane of Entry and can be a traffic hazard, especially if they don’t make appropiate radio calls/position reports. So John recommended I make a this call to alert any traffic in the area to my presence. Good safety tip! At Patonga I turned north onto a track of 349 degrees magnetic direct for Cessnock, put the aircraft into a climb for target altitude of 6500 feet and settled in for the 25-minute flight to Cessnock. Climb performance was not fantastic as we were still carrying close to a full load of fuel, we were probably only achieving a rate of climb of 400 feet per minute, so it was a good 10 minutes before I levelled out in the cruise. The flying was magnificent! Still air, no turbulence, and despite some building high cloud, CAVOK in all directions with clear views off the coast to our right, the Hawkesbury area and Blue Mountains to our left, and the Hunter Valley to our north. This is how conditions remained all day (despite one shower on approach back to Bankstown), which meant that I was able to climb to and maintain optimum altitudes for the entire flight. I was rapt. It’s so much fun to get up into the clear smooth air and be able to stay in it all the way, and the views are magnificent. This is one of the many things that make flying so much fun for me. After about 10 minutes in cruise, we approached the northern reaches of the coastal ranges and the southern end of the Hunter Valley. I put IJK into a 500 feet-per-minute descent, ran through the top-of-descent checks and started scanning for local traffic (visually and via the radio) as well as looking for the airstrip. 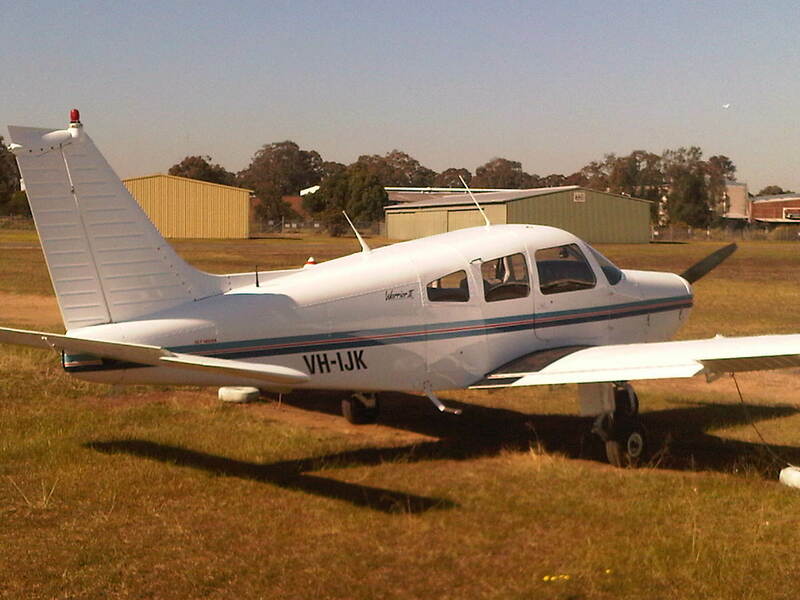 Radio traffic informed me that runway 35 was in use, which at Cessnock involves flying a right-hand circuit. So I descended to the west of the aerodrome to circuit height of 1200 feet and joined the circuit mid-crosswind, behind an aircraft doing circuits from the airstrip. Still not 100% sure of the fuel situation in the right tank, I switched to the (full) left tank as a safety precaution in case we had to do a go-around and needed power in a hurry. The landing was solid, though as John pointed out, my feet weren’t as awake as ideal. (I find this is one of the “feel” things that erodes as your time between flights increases). Regardless, we taxyed for the Cessnock southern run-up bay and parked and shut down for a quick stretch of legs and a fuel check. John checked the fuel. Full in the left tank (as expected) and about 30 litres down in the right tank. This squared precisely with my expectations of the fuel we should have used (according to my flight plan and fuel log), so we were 90% reassured that we weren’t losing any fuel. Run on the right tank for another hour so as to conserve fuel in our known “best” tank for the later stages of the flight and return to/landing at Bankstown. Cessnock to Warkworth – Diversion practice! 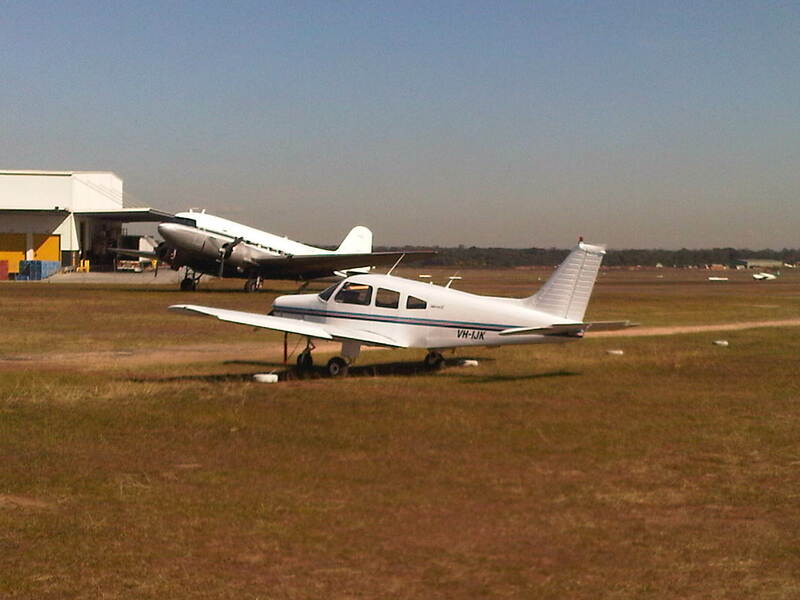 So, start-up, run-up and pre-flight procedures and checks, and I made the very short taxy to Cessnock’s runway 35. “Entering and rolling”, I made an upwind departure and climbed to 1500 feet above circuit height. Reaching that altitude, I turned direct for the Singleton NDB (non directional beacon), which is situated to the northwest of Singleton township. I was heading for the NDB as a means of skirting well clear of the Singleton Army Base, a restricted area located immediately south and west of Singleton. I climbed back to 6500 feet before reaching the NDB. As soon as I overflew the NDB John diverted me to Warkworth – diversions being part of the final PPL flight test, and something that I’d only done twice before. So with Scone out of the picture (as planned), I pulled out my VNC (Visual Navigation Chart) and quickly sketched a line between Singleton and Warkworth. Visually, the line was a straight line to the west, which I estimated meant a track of 270 degrees true, or about 258 degrees magnetic when adjusted for local magnetic variance. Laying my pencil – specially notched with 10 mile/6 minute increments – I estimated my time to reach Warkworth at 8 minutes. I then set course for Warkworth and set about making my radio calls to Brisbane Centre to amend my flight plan. I was very quickly in the Warkworth vicinity, overflying several large open-cut mines (this being the lower Hunter Valley). But could I locate the aerodrome? Could I hell. 5 or 10 minutes of circling around was fruitless. John encouraged me to bank the aircraft to both sides to improve my visibility of the ground, but to no avail. Finally John took pity on me and banked the aircraft steeply to the right to reveal that I was in fact right over the aerodrome! A grass strip used for gliding, I could even see the twin crosses marked on the aerodrome to indicate gliding operations. Oh well – didn’t find it that day, but I now know what the place looks like if that’s my diversion destination during my final test. After circling Warkworth for a couple more minutes I turned south to begin the southbound trip back to Bankstown, putting the aircraft into a climb to 7500 feet as I did so. Conditions remained beautiful – there was some cloud around, but well above us, with great visibility and no turbulence to speak of. South of Warkworth I still had to be mindful of remaining clear of the Singleton Army Base restricted area, so with a bit of map shuffling and visual reference to the ground I decided that if I could stay to the west of the road joining Warkworth and Broke – which is to the south of the Army base – I would remain in the clear. Once over Broke, I turned to align myself with the ADF (Automatic Direction Finder) needle, set the DI (Directional Indicator) bug and made straight for McQuoid. I checked the radio freqencies I’d need for the return trip and then “relaxed” for a few minutes with nothing else to do but steer for McQuoid and maintain straight and level flight at 7500 feet. McQuoid to Brooklyn Bridge: On track, or heading into controlled air space? We were over McQuoid after about 10 more minutes of cruising. I switched maps to my more detailed Sydney VTC (Visual Terminal Chart) and put the aircraft into a 500 feet-per-minute descent. (Estimated time from McQuoid to Brooklyn Bridge was 16 minutes and I needed to get down from 7500 to 2400 feet by that point, so a steady but not drastic descent was called for). I set course of about 161 degrees magnetic and started visually scanning for the general vicinity of Brooklyn Bridge, expecting to reach it in around 16 minutes. About 10 minutes in, John remarked that the area immediately south of us didn’t look much like what he was expecting, and he wondered if we were too far off to the right and heading for the controlled airspace of Richmond RAAF Base. A quick check of the map and a scan outside suggested he might be on to something, so I pointed us another 20 degrees or so towards the east. After another few minutes we caught sight of Brooklyn Bridge, which from its position off to our left confirmed John’s suspicion that we’d been far off track to the right. Had we maintained that track, unquestionably we would have busted into Richmond air space. This would not have been a good situation, either in general terms or particularly if this had happened to be my actual PPL test flight. Flight track adjustments made, we arrived over Brooklyn Bridge at 2400 feet and ready for our final leg home via the southbound Lane of Entry. As with navigating through the northbound Lane of Entry, going southbound it’s necessary to maintain pretty specific altitudes and headings to avoid infringing on various areas of controlled air space to the right and left. This also involves looking for some prominent land marks, and a couple of strobe lights as well. The first thing you’re looking for is the Berowra strobe, a visual navigation aid for pilots that lies just south and west of the Berowra township. Trouble is, the strobe wasn’t working on this day – and apparently has been out of action for at least 4 days. Anecdotally, it’s often out of action or hard to spot anyway. So I was a little unsure of what I was actually looking for. Another good reason for having done this flight today, as John was able to point out the general location of the strobe in relation to Berowra township, and also the actual location of the strobe, in a kind of cleared area. Next up are a couple more prominent features left and right of your required track – being particularly important not to stray right into Richmond air space – and in particular the South Dural strobe situated atop a water tank. This strobe was fortunately easy to spot, though CASA’s Class D procedures recommend that you be able to identify the water tank (green sides/orange top) without the aid of the strobe if needs be. At Berowra John commented on a couple of virga showers of rain in the vicinity up ahead. In simple terms, these are rain showers where the water evaporates in the air before reaching the ground. So amazingly, in a day of mostly CAVOK conditions with only high cloud and no precipitaion, I found myself briefly flying through a rain shower! From the South Dural strobe it’s a track of about 205 degrees magnetic to Prospect Reservoir and the inbound reporting point for entry to Bankstown. As I flew this final part of the leg I descended to 1500 feet and progressed through the required sequence of radio frequencies. Monitoring the ATIS for local weather and runway in use, I made my inbound call, then approached Bankstown and landed towards the east on runway 11L. Landing was reasonable, though in the light 8-knot crosswind I should have used more rudder on late final to achieve better alignment with the runway centre line. The usual short taxy back to parking and I shut down with the satisfaction of a great flight and the knowledge that the next cross-country flight I do will be my final test for my Private Pilot License! Checking the fuel in the tanks, I haven’t done the exact numbers but the fuel remaining in my right tank was about 35 litres, consistent with the additional hour or so I flew on the right tank between Cessnock and Bankstown before switching to my left. So I conclude that we in fact experienced no leakage of fuel from the suspect fuel drain underneath this tank. In my defence on point 5 above, it was the first time I’d navigated southwards over this area towards Brooklyn Bridge, so it was unfamiliar ground – and, flying over the hills in the Hawkesbury area away from the coast can make visual identification quite challenging, ground features being an extensive series of green hills interspersed by the occasional waterway, with only isolated and hard-to-spot landmarks or distinguishing features. At this stage – and subject to checking my flight plan in point 1, I’m inclined to think my track error was a combination of factors described in points 4 and 5. So, what can I do in the future to minimise the likelihood of making this mistake again – particularly when flying in this region north of Sydney? Never assume I’m “on the right track”. At all stages of flying a leg, make regular checks of your actual vs planned position and track using all means at your disposal: estimated vs actual flight times and positions, time checks over known landmarks, reference to navigation aids, general scanning and assessment of “am I, within reasonable limits, at or near where I expect to be”. Make sure I’ve read my flight plan correctly. No matter how clearly you’ve planned your flight, in-flight with other demands on you, it’s quite possible to focus on the wrong line on the plan and read a heading for a leg other than the one you’re actually flying. Take an extra second to make sure you’re reading the right figure. Assume that the winds you experience in-flight are different to those forecast. In other words, expect to be blown off track and to have to navigate and correct accordingly. Make it part of your work routine to always be looking for how far off track you are and what you have to do to correct it. If you find you’re maintaining track without any additional effort, so much the better. Southbound from McQuoid to Lane of Entry, incline towards the coast. In this specific area north of Sydney, flying the McQuoid-Brooklyn Bridge southbound leg, a safe way to leave plenty of margin between yourself and Richmond air space is to incline to making track error towards, rather than away, from the coast. Once the Hawkesbury waterways start to come into sight – assuming reasonable visibility – Brooklyn Bridge is reasonably prominent and you can always adjust your southbound track to arrive overhead. If you’re flying south on this leg and you can’t see any water, or the water is way off to your left, it’s a safe bet you’re headed into restricted air space. So that’s it. So far as my PPL is concerned, the training flights are over. The PPL flight exam is scheduled for Wednesday 14 September, hoping the weather is suitable. I’ll go out and do a solo hour in the training area a couple weeks prior to practise emergency procedures (stalls, forced landings, precautionary search and landings, steep turns) to brush up as it’s entirely possible I may have to do one or more of these during my final exam flight. And some study and revision between now and then, especially on the areas listed in my “Knowledge Deficiency Report” from my PPL theory exam. Can’t believe I’m nearly there! After nearly 6 weeks since I last flew (on my final cross-country solo) I managed to get out to the airport today for an hour of solo circuits. (Well, nearly an hour … 48 minutes to be exact, as circumstances conspired against me getting a full hour, but hey, it’s all good). I’m scheduled (weather permitting) to fly my final dual cross-country navigation flight next week, and I’ve already postponed it once. If this flight happens as scheduled, it will have been over 6 weeks since my last cross-country flight and in any case it’s been my longest interval so far between flights. I blogged recently on the topic of “how much flying is enough“, knowing that for some years to come my flights will be at a maximum of 4-6 week intervals. So apart from a desire to get out amongst it for an hour or so, I also genuinely suspected that I’m probably facing the problem experienced by all part-time pilots – that is, getting rusty. I figured I’d rather work out the kinks in the circuit, rather than cross-country next week, so today was my first time back in the circuit since my 4th circuit solo back in March, some 3 1/2 months and 33 flying hours ago. In short, it was great. Circuits may not be all that exotic in terms of things we prefer to do when we fly, but they’re valuable, they’re necessary, and I enjoyed the hell out of today’s flying. It felt good not only to just get out there, but also to circle back after my advanced training and my cross-country exercises and revisit some of the basics. And as it turned out, I was right. I am rusty, and today was an invaluable refresher course. I had my Warrior of choice, NFR, booked today, but the flying gods intervened as they are wont to do and I ended up flying UFY, another aircraft I know well (though slightly less so). I had my instructor John sign me out with the aircraft and do the DI (Daily Inspection) for me – remember I can’t sign off on a DI myself until I’ve got my PPL – and it all looked good. But, turned out that NFR’s stabilator was sticking – it was not moving up and down freely to the full extent of its normal range of movement. There was no obvious cause of this problem, and it simply wasn’t something I was comfortable ignoring. So, I quickly switched my booking from NFR to UFY. UFY was all good – John doing the DI for me on this also – but also was lacking air in the left landing wheel, causing me further delay while I called out the fuel truck and borrowed their air pump. So between all the frigging around waiting for someone to sign me out and DI my aircraft, inspecting NFR, switching to UFY, inspecting UFY and then waiting for the fuel truck, it wasn’t until 08:40 that I was ready for engine start and radioing Bankstown Ground for permission to start. (This against an 07:30 booking, for which I only had the aircraft until 09:30). But, c’est la vie. Start-up clearance received, I started UFY easily enough for such a cold morning (Sydney’s coldest in some 8 years or so) and headed out to the manoeuvring area and runways, feeling just ever so slightly rusty and keyed up after several weeks off. The weather was reasonable enough: bitterly cold (by Sydney standards at least) and with some nasty looking cloud above 5,000 feet, but CAVOK and with only an 8 knot crosswind blowing, so perfectly adequate for the purposes of a circuit flight. There’s not an awful lot of highlights to describe from an hour of 5 or 6 takeoffs and landings, so I’ll simply reflect on what was good about today’s session, and what could have gone better. Safety first. Doing the right thing in switching from NFR to UFY once the stabilator issue was identified: absolutely no point or future in taking a gamble on whether or not your aircraft is going to fly safely. General radio and airport procedures. 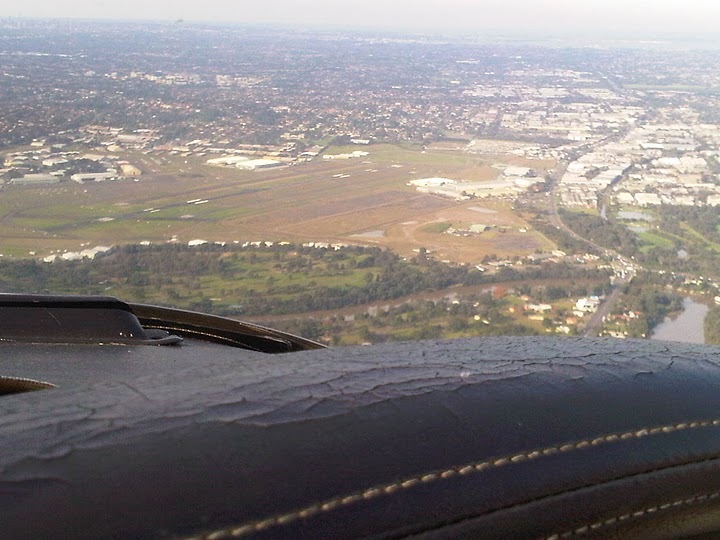 It’s quite a rigmarole when you fly in the circuits at Bankstown. Clearance for engine start; clearance to taxi; clearance when ready in run-up bay; taxi to runway holding point; clearance for takeoff; the mandatory downwind calls on each circuit; clearances to land; and the final clearance to taxy back to the parking area. But despite several months out of the circuit, it all came back quickly and easily. (I had been practising the calls out loud for the last week or so, which I find definitely helps). Situational awareness in the circuit. There were 5 others in the circuit with me this morning – a full house, as it were – and therefore at its busiest. But it didn’t phase me. I saw all the traffic I needed to, well in advance, including a Cessna 152 that overtook me in the circuit (much to the displeasure of Tower). I got better the more circuits I did. This might seem self-evident, but there was a marked difference between my first circuit today and my 5th or 6th (and last). The first 3 circuits – takeoffs in particular – were a bit scratchy, but the last few were hugely better. Flapless landing. I managed to get in a flapless landing on my final landing today, and it was far and away the best I’d done – a universe away from the 85-knot screamer I unleashed on my instructor back in my pre-GFPT checkride. Still got my pilot mojo. My blog friend and colleague Flying Ninja likes to refer to his “pilot mojo”, a concept I like a lot and completely understand. It takes a while to get it. I got it probably around the time of my first cross-country solo flight, and today I was relieved to feel that I’ve still got it despite so many flightless weeks. Long may it stay with me! Finding BROC on first take-off. On climb-out after my first take-off I was accelerating into the climb at around 200 feet AGL and could see the ASI touching 85 knots and rising. Weirdly, for a second or two I registered this fact and that I was going too fast – I really wanted to be climbing at about 80 KIAS to achieve Best Rate Of Climb. And for a split second – I still don’t know why – the answer seemed to be to lower the nose of the aircraft. My right hand even crept towards the trim wheel ready to trim the aircraft into a nose-lower attitude. Fortunately, sanity and my flight training prevailed and I remembered to my chagrin that to lower my airspeed in the climb-out I needed to raise the nose – which I did, and quickly found myself the desired airspeed of 80 knots for BROC. A bit disturbing that something so basic eluded me momentarily after a few weeks out. Yet another salutory argument for staying focused, sharp and alert at all time. My third landing. An absolute dog, a bone-crunching shocker. Totally took my eyes off the far end of the runway, don’t know where I was looking. Fortunately it was only 1 of 6, the other 5 being either good or very good. Forgetting to fly in balance. The first 3 takeoffs had me edging over the left hand boundary of the runway, the gyroscopic effect in UFY being so pronounced. Once I remembered to use some right rudder on takeoff and climb, this fixed itself and I managed to take off in a straight line. Maintaining 1000 feet in the circuit. Again, this got better in the 2nd half of the flight, but in the first 2 or 3 circuits I climbed up to 100 feet higher than the target 1000 feet, simply due to poor nose attitude and use of trim once I reached the downwind leg and levelled out. Landing roll on the first 2 or 3 landings. My use of pedals to control the aircraft’s direction via the nosewheel was not as strong, positive and proactive as it needed to be on the first few landing rolls, resulting in drifting off to the left of the runway centreline and a limited amount of (controlled) wobbling from side to side. Again, this problem disappeared in later circuits. All to be expected, I think. But as I said, I had fun. Which is the whole idea. And I feel a lot more confident going into next week’s cross-country nav flight. 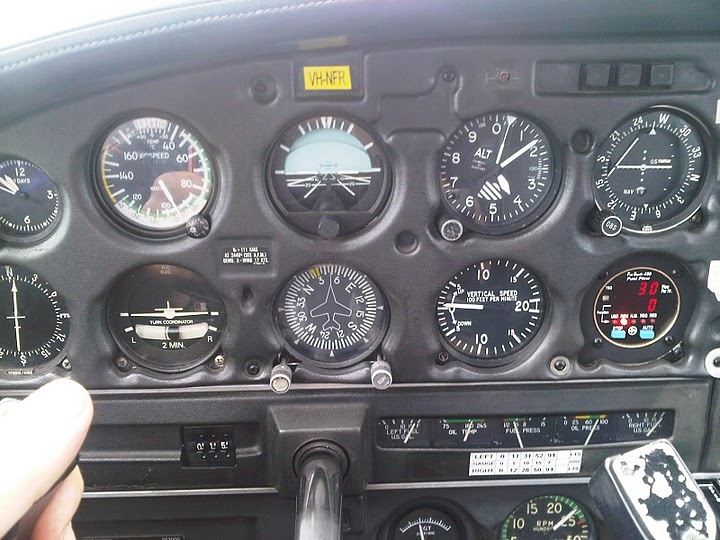 On Friday 3 June 2011 I flew my second – and final, pending my Private Pilot License tests – cross-country solo flight. It had been a full month since my last cross-country flight to Canberra. Since then I’d had a short flight in the training area, but nothing too substantial, so it was really good to get out and stretch my wings, as it were. Flying a few hours solo cross-country is part of the curriculum requirements for the Private Pilot License. On this flight it was necessary for me to achieve three things. First, minimum flight duration of 3 hours. Second, minimum flight distance of 150 nautical miles. And finally, 2 landings at 2 separate aerodromes. Reporting inbound to Bankstown at the 2RN radio tower (TWRN) then home. For weather and schedule reasons I’d postponed this flight several times. It was reassuring, during the preceding few days, to read consistently favourable forecasts, and conditions were CAVOK at my place when I woke up that morning, and out at the airfield a few hours later. Having already done most of my flight planning, it was relatively quick to check the ARFOR (Area Forecast) and TAFs (Terminal Air Forecasts) and factor the forecast winds into my flight plan for my planned tracks and time and fuel calculations. My instructor had a quick look at my flight plan and at the weather forecast and quickly signed me out to go. He DI’d the aeroplane for me (that is, he did the Daily Inspection – I can’t sign off on this until I’m qualified), wished me an enjoyable flight and left me alone without further ado. I taxied NFR to the edge of the taxiway and called up the fuel truck. (Fuel trucks being unable to go on the grass due to recent rain). I performed my own inspection of the aircraft as well – I make it a rule that I always do this even if an instructor has already DI’d my plane and signed off on it – and after getting a full load of Avgas in both tanks I was ready to go. Taking off to the west in calm and nearly CAVOK conditions, I exited the Bankstown control zone and climbed to 4000 feet, flying through the Bankstown training area and tracking for Warragamba Dam. At Warragamba I climbed to my planned altitude of 6500 feet and maintained the same heading to track for Cowra. 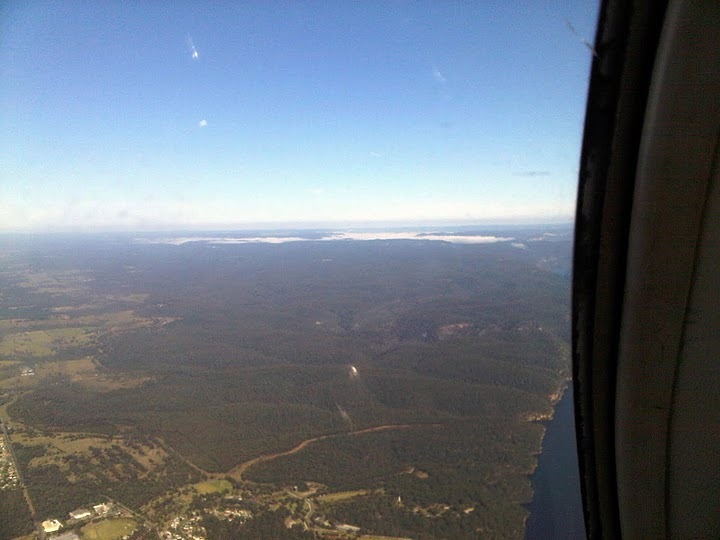 As I crossed the Great Dividing Range I could see large patches of morning fog abeam both sides of the aircraft. I knew from my pre-flight planning that Bathurst was fogged in, which was of mild concern as I planned to overfly Bathurst on my return leg later in the day. However, I figured I could check the weather conditions from both Cowra and Orange when landed at both those aerodromes, and if necessary steer clear of Bathurst. As things turned out, the Bathurst fog cleared well before I was back in the area later in the day. Once across and west of the mountains I noted an increasing build-up of cloud up ahead, roughly level with my altitude. I decided fairly quickly not to try to fly about the cloud, firstly because from what I could see it was building up to be at least 4 to 5 OKTAS (that is, covering four to five-eighths of the sky), and I felt that flying above the cloud layer would exceed my personal minima. Secondly, an increase in flight level would have taken me to 8500 feet (per regulations for flying levels about 5000 feet) which would put be just under Class E airspace. There’s nothing that would have forbidden me to enter Class E, but having never done so before, I decided my first time would not be on this day. Possibly over-cautious, but I prefer this to not being cautious enough. So it was down to reducing altitude and seeing how the flight progressed, being ready to turn around if the cloud forced me below the LSALT (lowest safe altitude) listed on my flight plan. So down I went, progressively, to about 5200 feet, putting up with the more turbulent air. As things turned out, the cloud didn’t force me any lower – albeit things were darker once I was under the cloud layer – so my passage to Cowra was unimpeded. 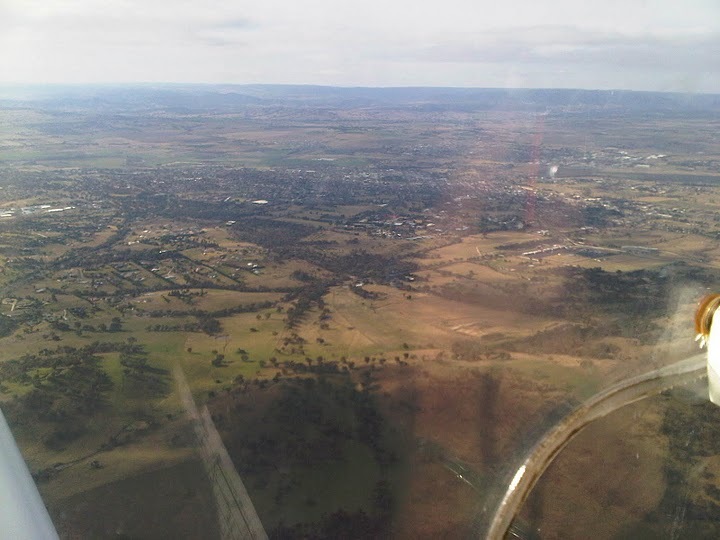 I flew the rest of the 1-hour leg uneventfully, noting more cloud off to my right around the Blayney area. Passing Mt Misery on my left and skirting the northernmost edge of the Blayney Wind Farm, I selected the frequency for the Cowra NDB (non-directional beacon) on my ADF (Automatic Direction Finder) receiver, making my inbound call to the Cowra CTAF when I judged myself within 10 nautical miles of the aerodrome and descending gradually to circuit height. There was not much wind evident in the Cowra area but as luck would have it there was a bit of traffic around the aerodrome, including a light trainer and a paraglider, both making radio calls indicating that runway 33 (landing towards the north-west) was in use. 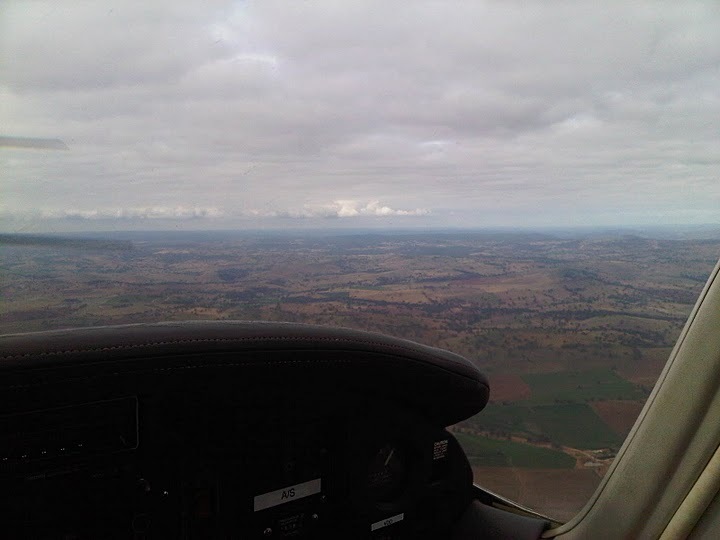 So I joined the circuit mid-crossfield and flew a standard circuit approach, making my mandatory radio calls as I did so, and made a decent landing at Cowra. I decided to park and take a toilet break, so taxied off the runway to the small Cowra terminal and parked on an otherwise empty tarmac. It was bitterly cold with no-one about (apart from a Diamond trainer who landed shortly after me), so I didn’t hang around too long. I took the opportunity to check the current weather conditions at my next destination of Orange, courtesy of the web browser on my Blackberry phone, and while indications were low-ish cloud around the aerodrome, nothing suggested that I alter my flight plans. So without further ado I started up, backtracked on 33 then turned around and took off to the north-west, circled left and climbed to circuit height, then overflew the aerodrome and tracked direct for Orange. It’s only about 20-25 minutes flying in a Warrior from Cowra to Orange and a pretty straightforward leg of flying, apart from staying well clear of a designated danger area off to your left in the form of an open-cut mine. So aided by my ADF turned in to the Orange NDB I pretty quickly found myself in the Orange area and listening to the CTAF for clues on local traffic and runway in use. Turned out there was quite a bit of traffic around the Orange circuit – probably the busiest day I’ve so far experienced at a non-towered aerodrome. Amusingly, one pilot in the area was clearly from the West Indies, broadcasting his position and intentions with a lovely Caribbean drawl that made me picture Bob Marley in the cockpit (“November Mike Lima, turnin’ ba-a-a-se”) and brought a smile to my face. Fortunately, my experience from my first solo flight landing at Wollongong had taught me the value of extreme vigilance in and around the circuit area and I made sure not to rely solely on what I was hearing through my headset and to keep a very sharp look-out. Despite the several aircraft in the area, I felt calm and in control of the situation, which as a small but satisfying confidence boost. Traffic was landing in the 29 direction (towards the west), unlike my previous visit to Orange when landing was in the easterly direction. Finding myself approaching the aerodrome on the live side of the circuit, I decided to join on the downwind leg and announced my intentions accordingly. I was quickly down on the ground with another satisfactory landing. On roll-out and approaching the main taxiway connecting the Orange runway with the terminal area, my path on the taxiway was blocked completely by a large twin (not sure what it was, possibly a King Air) or something larger, so I was left with no choice but to taxi the full length of the runway to exit on the smaller taxiway which I knew to be at the runway’s far end. So I kept up my speed – not wanting to hang around on the runway and knowing that other aircraft would soon want to be landing behind me – and fairly sprinted for the taxiway, breathing a small sigh of relief than I was able to radio my “clear of all active runways” message. I taxied to the Wade Aviation hangar where the fuel bowser is located, and finding another aircraft already fuelling, parked just across the taxiway and shut down. Once he was clear, I started up, taxied to the bowser and shut down again, then hunted down someone in the Wade hangar to help me with fuelling. Armed with one of their swipe cards, I filled NFR up, returned the swipe card, paid for the fuel and sat down in the adjacent small lawn area for a quick lunch. It being time to go – and wanting to get back to Bankstown so I could get home in a reasonable time – I was back in the cockpit and going through pre-startup checks still wiping crumbs from my mouth. A quick check on the CTAF frequency told me that the traffic pattern had changed and Orange traffic was now using the 11 runway – a takeoff to the east. So without further ado I was away, with the usual pre-takeoff checks and the mandatory radio calls. Tracking east direct for Bathurst I climbed to 5000 feet and levelled out, with cloud still above me and not wanting to move above 5000 and be in contravention of the regulation requiring any flight tracking between 0 and 179 degrees magnetic above 5000 feet to maintain altitude of “odd plus 500” thousand feet (eg. 5500, 7500). From this point, it was uncovered territory for me. On my previous flight in the area, Bathurst was the point at which my instructor had given me, as an exercise, a diversion south to Oberon. This time, no diversions were necessary and I was bound direct for Katoomba. So I set course south-east for Katoomba, noting that as I tracked eastwards the cloud appeared to be lifting again. 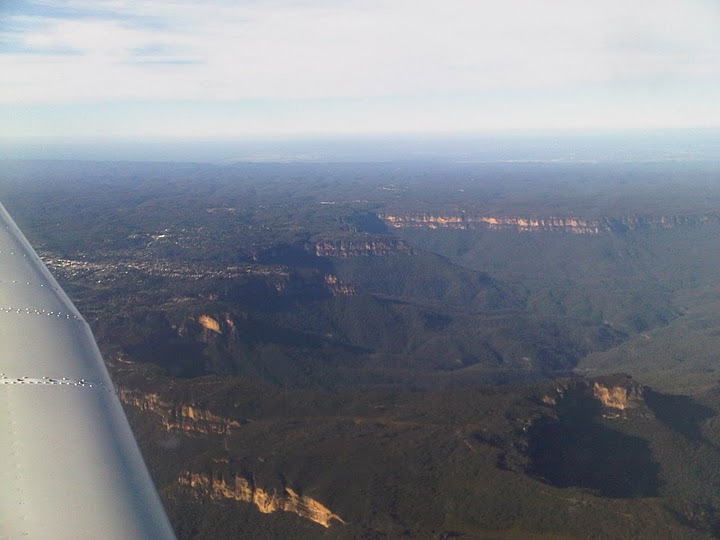 As I approached Katoomba I decided not to overfly the airfield proper, preferring to skirt west of Katoomba and over lower ground, giving me more options in the event of an engine problem at that point in the flight. To my pleasure – especially given the mountainous terrain of the Great Dividing Range that I was crossing for the second time that day – abeam Katoomba just before crossing the range proper I was able to climb my planned altitude on that track of 7500 feet. 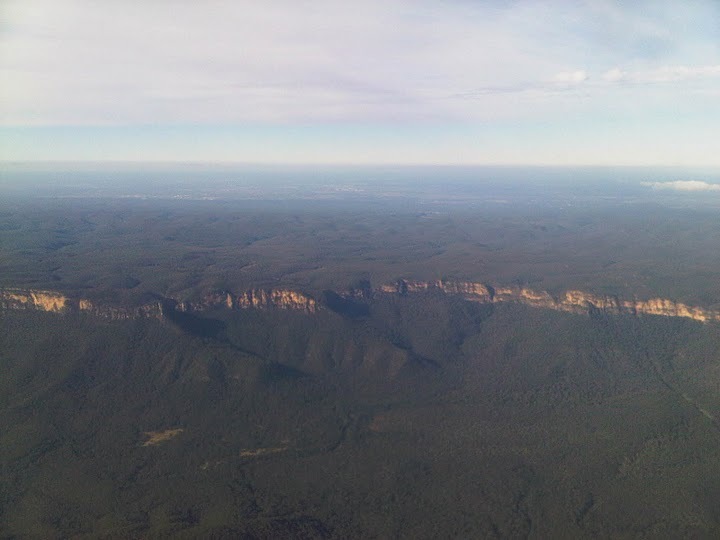 This was the highlight of the day’s flight, not only allowing me (albeit briefly, as I was close to home) to climb into some gorgeous still air, but also affording me some truly majestic views of the Blue Mountains and the Great Dividing Range, with serried ranks of imposing sandstone cliffs and escarpments rising above the greenery. These moments truly make recreational flying worthwhile. I was struck, although still some 50 nautical miles away from home, just how early I could see the smudge-like look of the entire Sydney Basin open up before me as I glanced left from 7500 feet up. Which reminded me that I was pretty close to home and I should start thinking about how I was going to get there! Approaching Sydney from the north-west as I was, the logistical issue to be dealt with was to avoid infringing on controlled military airspace in the Richmond area (that is, Richmond RAAF Base), which lay directly between me and Bankstown as the crow would have flown. (The alternative would have been to seek an airways clearance to enter Richmond airspace, which is frequently done in certain circumstances, but hadn’t done it before – my flight through Canberra’s Class C airspace notwithstanding – and wasn’t about to attempt it now). 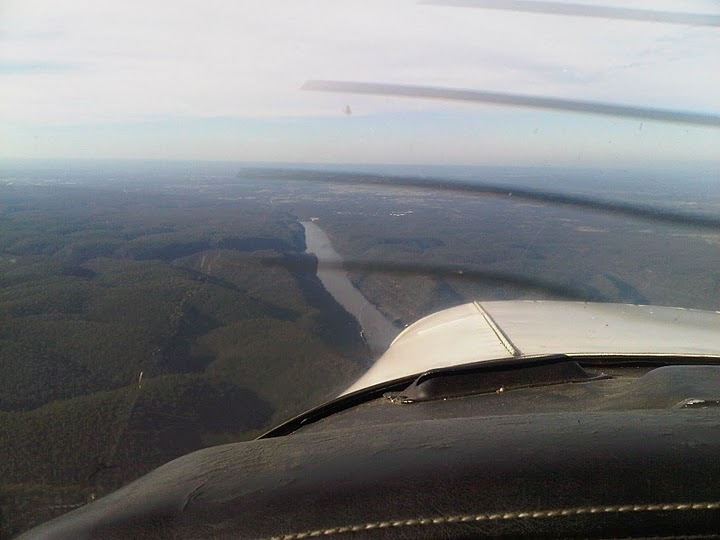 I started descending, knowing that I had to get down from 7500 feet to 4000 feet by the time I reached Warragamba Dam to fly under the Sydney Class C control step. And as a quick means of confirming how far south I was on my track towards Warragamba Dam – enabling me to skirt the Richmond area – I tuned my ADF receiver to 576 kHz, the frequency of ABC Radio National as broadcast by the 2RN tower which is one of the two inbound reporting points for Bankstown. Noting the ADF needle swinging to roughly 45-450 degrees to my left, I reasoned that it wouldn’t be long before I’d be needing to turn east to head home and that I must be getting close to Warragamba. Almost immediately, I sighted what I now know to be Lake Burragorang – the main water storage that is impounded by Warragamba Dam – up ahead and knew that all I had to do was to turn left and follow it all the way to the dam. Which I did, continuing to descend to 4000 feet, and I was soon overflying the dam, seeing the expanse of the Sydney Basin open up before me. Ten minutes more and descending to 1500 feet, I was quickly at 2RN and, inbound clearance received, joined “right crosswind” (a slightly unusual direction from Bankstown Tower) for my approach and landing from the east on runway 29R. Down with a light landing, I was soon parking, shutting and then tieing down the plane, knowing that the next time I fly solo cross-country will be after I have gained my Private Pilot License. The main thing I took away that I think I need to work on is to work on the strict discipline of tracking my progress against my flight plan. I think I was a little bit spoilt on this flight in that I’d done it before (albeit with an instructor beside me) and therefore didn’t perhaps have to work quite as hard on staying aware of where I was as I might otherwise have had to. I feel that I could definitely improve in terms of using my watch to maintain frequent estimates of how far along (and off) a flight planned track I may be, and cross-checking those estimates against visual indicators on the ground. I’m not saying I’m not doing these things – far from it – but I think there’s plenty of room for improvement in terms of how often I do it, and how accurately. Since making this flight I’ve passed my final theory exam and once cancelled my final cross-country dual training flight due to illness. I’m hoping to do this final flight in a couple of week. Once that’s done, all that remains is the PPL test! How much flying is “enough” to “keep current”? As regular readers of this blog may have noticed, the blogging frequency has dropped way down. The main reason for this is that, unlike my intense training period in March/April of this year, I’m not flying every day, but only every few weeks. In addition, I’m now in the very late stages of my path to achieving my PPL, with all exams now done and only a single dual cross-country nav flight standing between me and my final PPL test. So the vaguely vexing issue of long-ish intervals between training flights has been somewhat on my mind. As I write, it’s been nearly 4 weeks since my last flight, which I believe is the longest interval since I started my flight training. I had the final dual nav flight scheduled for Wednesday of this week, but as fortune would have it, I was ill over the weekend and as of Monday this week I was still recovering. As a precaution – not wishing to take to the air with any remnant whatsoever of the stomach bug I was suffering from – I cancelled the flight. For various reasons, the next workable day on which I can do this flight is 20 July, a few weeks from now. I compared that to the last date on which I flew – back on 3 June – and saw that this is an interval of 47 days between flights. A cross-country navigation/pleasure flight every 3 months, including the occasional Victor One/Harbour Scenic flight for friends/visitors. What do you guys think: what is the “minimum” frequency with which you try to fly, so that you feel “current”? A few weeks after writing this blog entry I ventured back into the circuit after nearly 6 weeks of no flying. This gave me some insight into just how rusty you can get after even a relatively short break from flying. Something to be well aware of for “weekend warriors” such as myself.